Innovation has been the gold-standard theme of technology marketers since they processed the first silicon chip, but the marketplace is changing. People have been bombarded with over-hyped and unsubstantiated claims. People listen differently now. Innovation matters, but cutting through and being heard is a harder proposition than ever for even the most innovative companies. Innovation is everybody's claim and, therefore, seemingly no one's advantage. 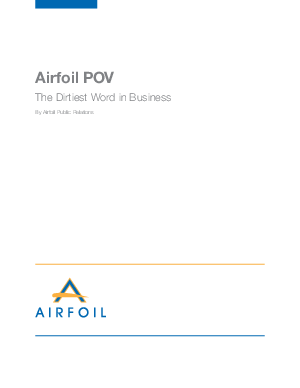 In our latest Point of View, "The Dirtiest Word In Business," Airfoil has assembled a collective set of best practices to help technology marketers meet the communications challenges of a new digital decade.